Compost Tea: Put a Bit of Magic in your Garden! WHY USE IT? : How long have you got? 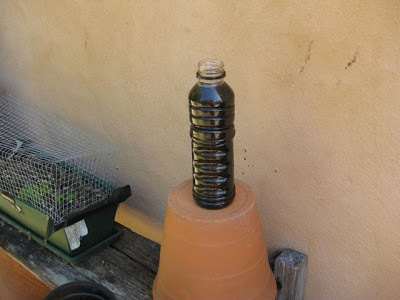 A bottle of the good stuff – undiluted, homemade, compost tea. The tradition of using compost tea to feed the garden is centuries old and each community has their special way of making it that is steeped – like tea, in collective, shared and ancient knowledge. This next bit makes me feel very ancient, but I was brought up in inner-city London in the era of horse drawn carts that brought bread, milk, coal and the rag and bone man (scrap stuff). We used to keep a coal shovel by the front door so that we could race out and scoop up the horse poop, after these tradesmen have been around, before our neighbour ‘Old Fenton’ got to it. He wanted it for his prize dahlias and my father wanted it to make compost tea for his allotment. Simple pastimes before the days of television and computers. When I came to Sydney in the mid-seventies we moved to an area with lots of Greek and Italian migrants that had abundant edible gardens. I paused in wonder at seeing for the first time things growing that I had only ever seen in books – like aubergines and fennel with oranges and lemons hanging over the garden walls. Most of these gardens had a large barrel that contained their special liquid ‘brew’, with a recipe brought from Kythera or Calabria. It also helped that around them, in every back lane, were the stables for Randwick racetrack and mountains of free horse manure. You will need: A bucket, an old hessian bag or cotton pillowslip for your tea bag and a good few handfuls of compost. Put the compost in the bag, secure the top and dunk it in the bucket filled with rain water. Soak for a week, jiggling the bag a few times a day. Dilute to the colour of tea and pour directly onto the soil. NOTE: This is a very good brew for activating a ‘tired bed’ or a new no-dig bed. It is loaded with micro-organisms that gets organic matter breaking down and subsequently soils revitalized pretty quickly. 2. 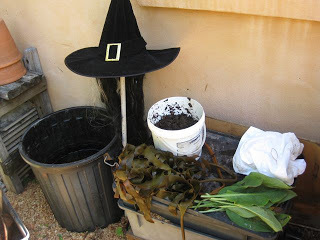 My Compost Tea: 3 things – SEAWEED (brown kelp), ANIMAL MANURE and fresh COMFREY LEAVES. WHY THESE THREE? Seaweed enriches the soil: Seaweed is a broad spectrum fertilizer that is rich in beneficial trace minerals and hormones that stimulate plant growth. Seaweed is high in carbohydrates which are essential building blocks in growing plants, and low in cellulose so it breaks down readily. Seaweed shares no diseases with land plants. Boosts lethargic plants: Seaweed fertilizer contains an abundance of fully chelated (ready to use) micro-nutrients which can be readily absorbed by plants without any further chemical decomposition needed. Seaweed is high in potassium – essential for the production of healthy roots, flowers and fruit. Animal manures contain a multitude of beneficial organisms and nutrients that biologically activate your brew and subsequently your soil. They are usually high in the three essential plant macro-nutrients nitrogen, phosphorus and potassium. By composting them this way you eliminate any ‘nasties’ in them like weed seeds, animal pathogens, chemicals and drugs that may have administered to the animals to make the ideal liquid fertilizer. Comfrey is a dynamic accumulator – that is it ‘mines’ nutrients from the soil so adding it to your compost tea will boost it’s macro and micro nutrient levels – essential for plant growth. It is very high in nitrogen and contains 2-3 times more potassium than farmyard manure. Comfrey is fast-growing, herbaceous, perennial plant of the borage family with a thick and tuberous root system, allowing the plant to ‘mine’ compacted soils for minerals and other nutrients which are often difficult for other plants to obtain. It is an essential addition to any garden. Making Potions – Welcome to Hogwarts! A container with a lid for mixing your brew in – I use a garbage bin. An old pillowcase with a rubber band for sealing it – this is your tea-bag – just make sure it is made from a natural fibre – like cotton! Rainwater for mixing it – chlorine in town water harms biological activity. Somebody who knows how to make spells. Put the comfrey, seaweed and manure in the pillowcase and seal it with the rubber band. Soak it in the bin that is three-quarters full of rainwater. Leave it to soak for a couple of weeks giving it a stir now and again. NOTE: You can keep on using it over a few months until it is used up. The comfrey will make it smell! As a liquid fertiliser for the soil: Scoop out some of the brew into a bucket or watering can, dilute to the colour of weak tea and water into the soil for a fast and fantastic nutrient boost. Directly applying the diluted compost tea brew to the leaves as a foliar spray has a multitude of benefits – it is a gentle tonic for the plants that is absorbed straight away – a liquid fertilizer boost (it takes more time via root system) also the micro-organisms help to protect the plants against disease. This is particularly beneficial against fungal attack e.g. mildew on zucchini/peas and beans. NOTE: You will have to strain the brew if you are using it in a sprayer. I use it to give plants a potassium boost when they are in bud (eg. beans and strawberries – in fact anything that is going to flower and fruit) to encourage the production of flowers and fruit set. Seedlings and young plants will also benefit from a compost tea spray every 3-4 days for a phosphorous boost, which they need for the development of healthy roots. Stress relief!! You need it and so do plants, particularly when you are transplanting seedlings. By giving them a spray with dilute compost tea you are giving them a boost of vitamin B1, which is a constituent of seaweed, and reducing transplant shock. Powdery Mildew: Control with milk! | GROW FOOD slow food - […] provides the nutrients plants require to resist these fungi.